Review posted October 18, 2018. Andrews McMeel Publishing, 2015. 222 pages. This is the second collection about a girl named Phoebe and her best friend, the unicorn Marigold Heavenly Nostrils. And I am officially a Phoebe and her Unicorn fan. In this volume, Phoebe releases Marigold from the wish that made Marigold Phoebe's best friend - and discovers Marigold wants to be her friend anyway. Phoebe faces normal kid things - such as wanting a part in the school play and competing in the school spelling bee against the boy she has a crush on. But she also faces things unique to someone whose best friend is a unicorn who is convinced she's the best thing in the universe. 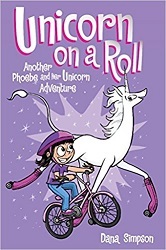 One nice sequence is when Phoebe gets to go to the land of the unicorns for a party - when the unicorns decide to hold an intervention, trying to convince Marigold to stop being friends with an icky human. They are unsuccessful. This comic strip is all that a comic strip should be - inventive, funny, true to life, and with insights about life that sneak up on you.